Monit is a free and open source monitoring system for Linux. It’s one of the essential tools a sysadmin must have. Use the following examples to create your own checks and your own conditions that will suit your need. 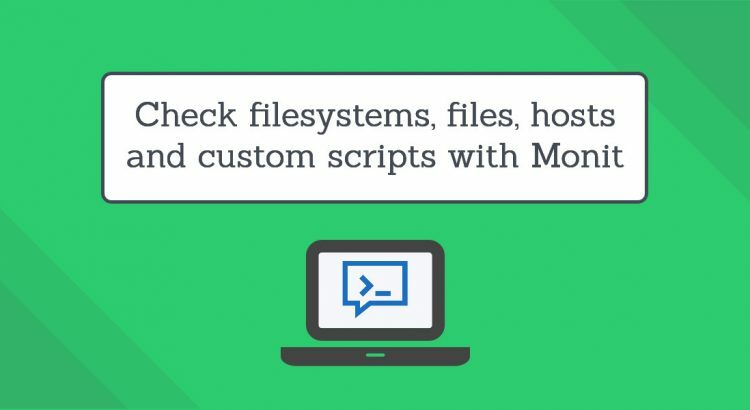 With Monit, you can check a certain filesystem. As we are using include /etc/monit.d/* (it’s just another way of configuring Monit, you can put all of this in /etc/monit.conf too), we need to first create the appropriate file for the check we are about to configure. You can also name the file to your liking, it does not have to be the same as the example. check file certificate with path "/root/ssl/mydomain.tld.crt"
check file important with path "/root/packages/test"
check program stat_check with path "/root/packages/test.sh"
Of course, you don’t have to do any of this if you use one of our Software Installation Services, in which case you can simply ask our expert Linux admins to setup this for you. They are available 24×7 and will take care of your request immediately.